"In The Shadow of His Father He Journeyed", serves as a site-specific memorial for my late father. 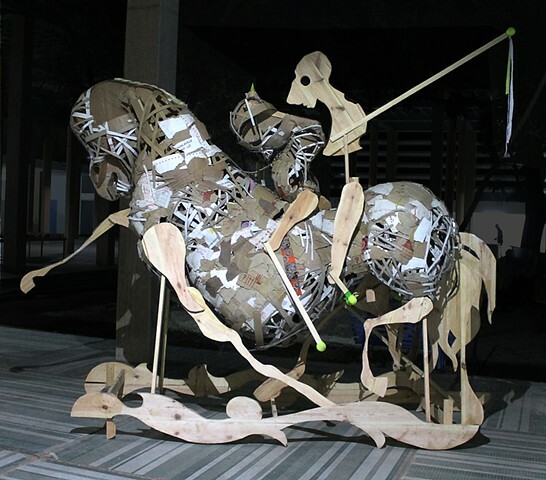 This work was constructed in Dakar, Senegal, from predominately-salvaged cardboard gathered from Park Lambaye, in Dakar. Much of the cardboard boxes had various African family names, and shipping and sender addresses which signified a constant exchange within the country. The residue of import, export, and exchange served as the dominant motif in this work. The metaphoric notion of journey was also of great importance. Ideas related to journey in this work references instances of rites of passages such as Life to death, childhood to manhood, and soul travel and guidance within the after-life. Inspired by research on Joseph Campbell’s mono myth, these ideas serve as points of reassurance, healing and coping with the loss of my father. In this work, cardboard is sparsely decorated with found material from the city of Dakar that includes local fabrics, wood, tennis balls, and costume jewelry purchased from one of the many outdoor markets in downtown Dakar. Using such material, I challenge art historical models of monument construction. The embellishments bestow a sophisticated visual coherence in the material, whereby viewers are invited to gain a new appreciation for the material and its contents. Through repurposing, this work achieves an alchemical stature that challenges the notion of beauty. Other points of references include Greek mythology, the Return of Hephaestus, and the historic Spanish novel and play, Don Quijote as I portray the return of a broken man. I use the horse as metaphor for power and authority and the riders as the rejection of such structures.